(A.A. Hébrard, Paris); sold c. 1921 to (Walther Halvorsen), apparently for sale in New York; sold or possibly consigned to (Durand-Ruel Galleries, New York), by 1922; possibly consigned 1923 to (Leicester Galleries, London); possibly consigned 1923 to (Casa Editrice d'Arte Enzo Pinci, Rome); possibly consigned 1924 to (Galerie Georges Petit, Paris); sent 1925 to (Ferargil Galleries, New York); sold 1926 or later to Arthur Bloch [1882-1953], Philadelphia. Lessing J. Rosenwald [1891-1979], Jenkintown, Pennsylvania; by inheritance (or possibly a gift) to his wife, Edith G. Rosenwald [1893-1988], Jenkintown; gift 1989 to NGA. See Caroline Durand-Ruel Godfroy's account in Pingeot 1991, 31. Czestochowski and Pingeot 2002, 141, where 1926 is assigned as the year of purchase; however, given that the Ferargil Galleries "List of Sales, January 1926-March 20, 1936" (their records, 1900-1963, Reel D322, frames 351-424, Archives of American Art, Washington, D.C.) spanned a ten year period, the purchase could have been made later. Although Ferargil's records list Arthur "Block" as the buyer, this is almost certainly Arthur Bloch, a partner in N. Snellenberg & Co. (a department store in Philadelphia and Wilmington) and wealthy collector whose interests included material related to Benjamin Franklin (see a Parke-Bernet Galleries sale of 20 October 1954 in New York). 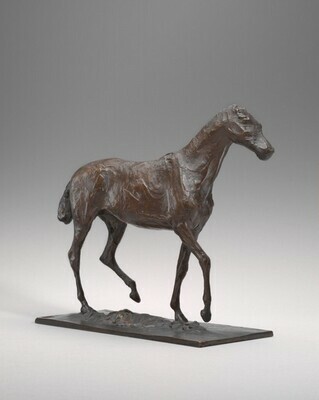 Exhibition of Bronzes by Degas 1834-1917, Durand-Ruel Galleries, New York, 1922, no. 52, as Cheval en marche (les oreilles manquent). Possibly Exhibition of the Works in Sculpture of Edgar Degas, Leicester Galleries, London, 1923, no. 52, as Cheval en marche (les oreilles manquent). Possibly La Seconda Biennale Romana, Mostra Internazionale di Belli Arti. Sculture di Edgar Degas 1834-1917, Casa Editrice d'Arte Enzo Pinci, Rome, 1923, no. 52 or no. 55 (different catalogues give different numbers), both as Cavallo di marcha. Possibly Exposition Degas, au profit de la Ligue franco-anglo-américaine contre le cancer: Peintures, pastels et dessins, sculptures, eaux-fortes, lithographies et monotypes, Galeries Georges Petit (sculpture shown at Galerie A.A. Hébrard), Paris, 1924, no. 305, as Cheval en march (les oreilles manquent). Exhibition of the Works in Sculpture of Edgar Degas, 1834-1917, Ferargil Galleries, New York, 1925, no. 52, as Horse Walking (Ears missing). Degas and America: The Early Collectors, High Museum of Art, Atlanta; Minneapolis Institute of Arts, 2001, no. 76, repro. Déja Vu? Revealing Repetition in French Masterpieces, The Walters Art Museum, Baltimore; Phoenix Art Museum, 2007-2008, no. 34, fig. 49. Pingeot, Anne. Degas Sculptures. Paris, 1991: no. 52. Sculpture: An Illustrated Catalogue. National Gallery of Art, Washington, 1994: 67, repro. Campbell, Sara. "A Catalogue of Degas' Bronzes." Apollo 142 (August 1995): 10-48, no. 10. Czestochowski, Joseph S., and Anne Pingeot. Degas--Sculptures. Catalogue Raisonné of the Bronzes. Memphis, 2002: 141. Lindsay, Suzanne Glover, Daphne S. Barbour, and Shelley G. Sturman. Edgar Degas Sculpture. The Collections of the National Gallery of Art Systematic Catalogue. Washington, D.C., 2010: no. 3, 72-73, color repro.